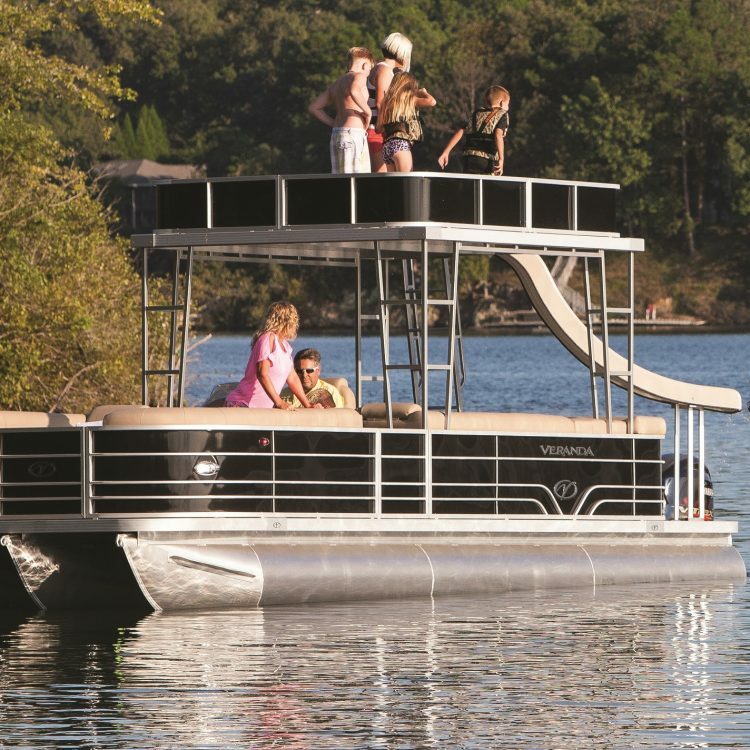 Looking for a pontoon that for the family that can do it all? Take a look at this one. The hard top is perfect for sunning, jumping, or just relaxing and with the built in slide the kids can play all day. Triple tube option with 225HP you can ski, board, and pull tubes for more water sports. Boat is equipped with the LED light package to light the interior and the exterior for evening cruising and fun. Upgraded flooring, upgraded panel and railing colors (Champagne panels with Copper rails), and in-floor ski/board storage to round it out. Give us a call or email for more information. Available with or without trailer and delivery is available. Beautiful new Veranda Hard Top with Slide. This triple tube is equipped with stainless steel package, in floor ski & board storage, woven flooring upgrade, captain chair upgrade, 27 inch pontoon upgrade, turbo swing ski tow bar, and stainless steel propeller. Give us a call today for more information on this beautiful new Veranda. Available with/without trailer and delivery available. Copyright © Rothwell Marine, All Rights Reserved.